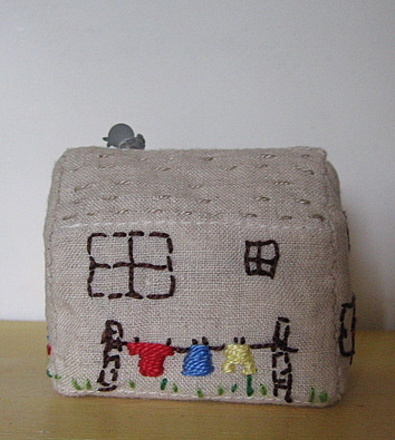 Perhaps she'd like a little fabric house ? Mind you, I didn't make this one for my Mother - my Mother associates 'handmade' with being too tighty arsed to buy something, and anyway she'd rather have twenty quid to go to the bingo. 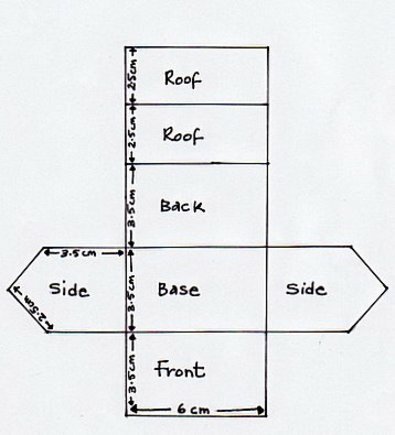 I've written the measurements for mine, but you can enlarge if desired, particularly if you are making one as a softie as shown at the bottom of this post. I forgot to take a pic after I had sewn mine silly me, but after you have stitched, cut out leaving a small seam all around. Turn right side out and close gap. 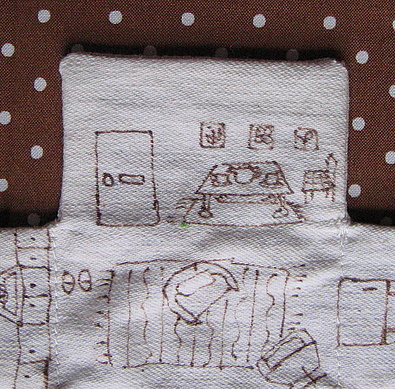 Now machine stitch along the line of every junction (is that the right word ?) in other words where the base meets the walls,the back wall meets the roof, and where the roof bends, these points are marked on the template as solid black lines. 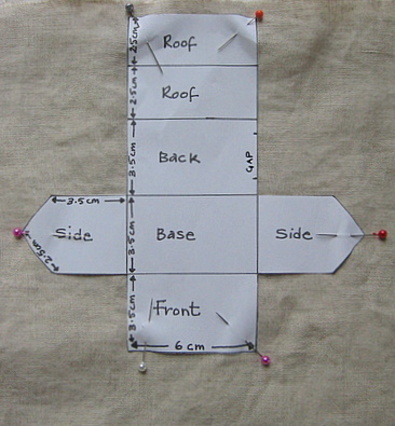 This will makes it easier to fold your house when it comes to sewing it together. (If you understand what I just wrote there, you're a bloody genius, but you'll see what I mean when I show you the next pictures). 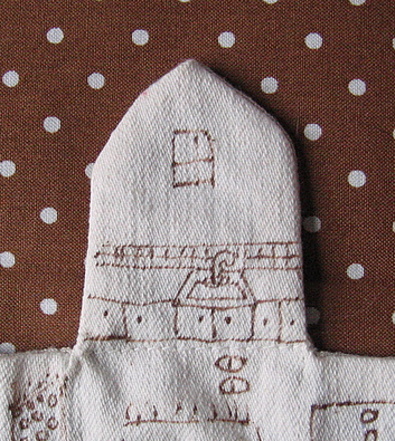 Can you see my machine stitched junction lines ? 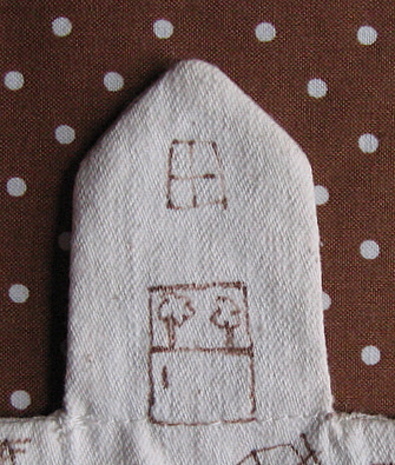 the one above is very wonky but that doesn't matter it's an old wonky cottage. 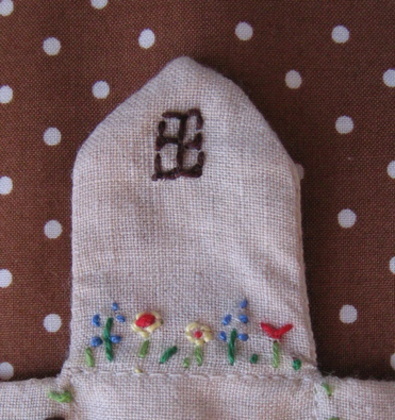 Stitch a little birdy button to the roof if you have one. but you could fill yours with foil wrapped chocolate hearts or diamonds or anything you think your Ma would like. 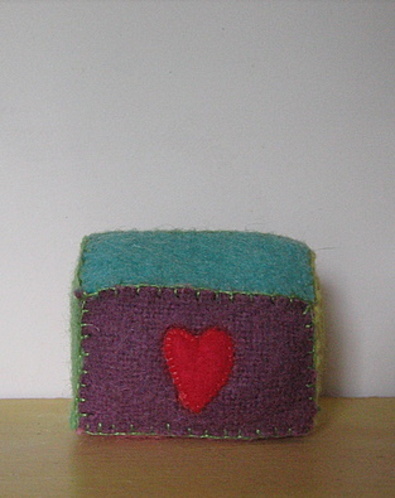 Alternatively make one from felt and use as a pincushion, or make a larger one as a toy for a child (and, handily, because they're nice and soft, you can also throw them with great force at a child and you won't do them any serious damage). 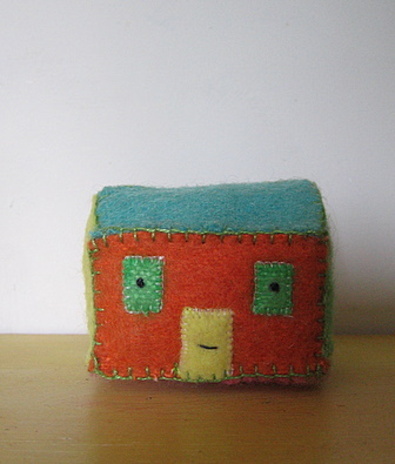 Just cut each part of the house out of different colour felt or dyed felted blanket and blanket stitch together. Don't forget to stuff it of course otherwise there will be no fun in throwing it. I hope you have a fun weekend everybody, back soon. Oh I nearly forgot, a few people asked for the crochet flower pattern, I got mine from The DK Pocket Encyclopedia of Needlecraft ISBN 0 86318 302 6 , so I'm afraid I can't put the instructions up here. There are some lovely tutorials on the web though, so if I were you, I would while away an hour or two trawling the net tonight (with the obligatory glass of vino of course). Greetings from the U.S.! I've been lurking for months and love all your posts and tutorials. This house is adorable! What a great idea for gift-giving. Thanks for passing everything on. As ever, ta very much. Love that it's decorated inside too. Does your mum blog too? Would be a great to get both sides of the story. You are brilliant! I love your amazing house design! 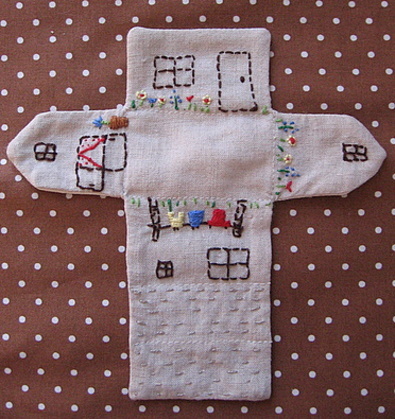 I think I shall make one for my daughter to keep her quiet in church. Wouldn't it be cute to make a whole family too? I love this....I think it would be an adorable mother's day gift! It's just lovely. It's rare when I actually make something demo'd in a blog, but I really think I will make this! These are too, too lovely! Very cute. 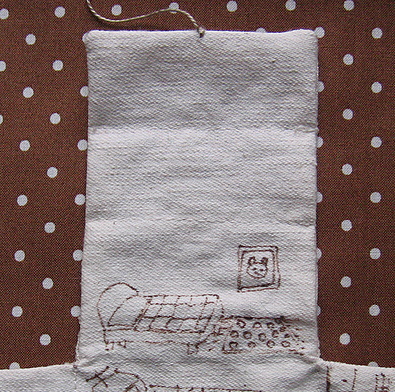 It would also be cute to put little straps on it, sort of like a purse for the little ones to carry. I love this. I think I will be making quite a few of them. Thank you for showing us how! Thanks for the tutorial, don't know about my mother but my daughter will surely love it. I'll try making one with my granddaughter. More likley to throw a house brick that a soft house at my bickering children today! A great idea, I'm going to make one and keep it for myself! That's so cute! Thank you for sharing the pattern and tutorial. I'm going to make one for my daughter and me! Thankyou for sharing the 'how to's'!!! thanks for the tutorial! And your mom? She's funny. I see where you get your sense of humor from! That's so cute! I love Brian especially. Your posts are always so amusing, you have a great sense of humour! Thanks, Lyn. That is stinkin' adorable. Gotta go make two now, wait, make that three, no, four... there's Mom, the two kidlets, and I think I need one, too! How cute. 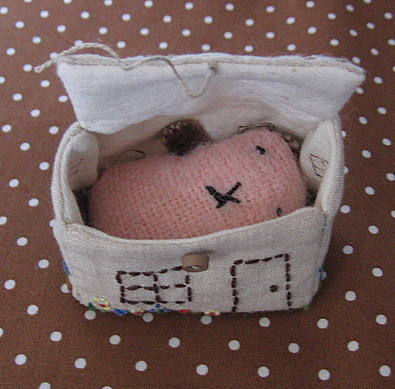 My daughter is obsessed with dogs, so I think I'll decorate one as a dog house for one of her stuffed animals. Those are so precious! Thanks for sharing! Could that even be any cuter? no. This is great, I love the idea of making a big one! Thanks so much for the detailed directions and pictures! The houses are really cute! I must admit I feel kind of shocked by your little story about your mom.. Keep on with the lovely handmade things you make, anyway! I hate to admit how much I look forward to your new posts....I find you so refreshingly honest and hilareously funny....You really should write a book....(in your spare time of course)....Thanks so much for your gifts of laughter and inspiring do-able crafts. My Mom won't be getting this one either....because I want it for myself! A wonderful gift and an inspiring tutorial! Thank you so much! I just love this! I love this idea and I think we might make one, or more, soon. So darling . . . thanks so much! My sweet mom is also not the hand-made gift type, but lots of my friends are...and my husband's name is Brian! I love this house. I was thinking it's too bad that my daughter is almost 18, instead of 4. But then I thought, why not make it for me? I just may do it! Very cute! get me one ... now! 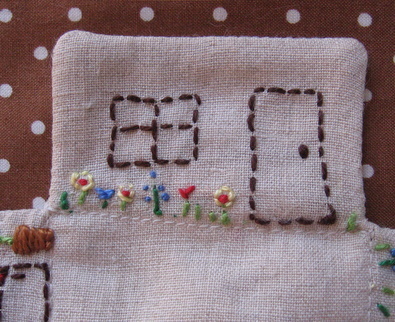 Your little houses are so cute! I want to make one just like the first one! Thank you so much for sharing this with us. What an adorable gift! My mother would take the money too! I'm a sucker for little houses and this one's adorable! Thanks for taking the time to share your lovely tutorial. What a darling house! Thanks for sharing the pattern. I hope your mom hits it big at bingo! 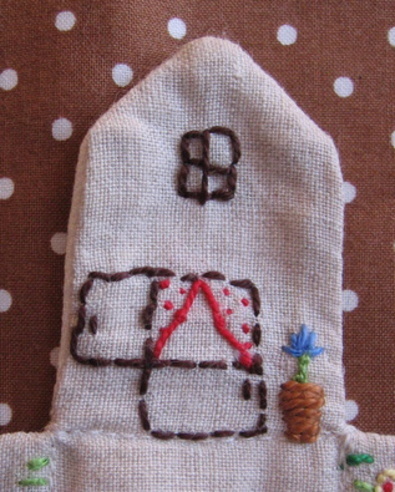 I LOVE the little house - it makes me think of an episode of Bagpuss where the mice mend and stuff a cloth house - I love your posts - they always make me smile! ooh, thank you for the tutorial and pattern sketch. i think one with a handle on top to carry as a little purse would be perfect, i better get to it. Thanks for the funny post and the great tutorial! I really love the wonkyness of the house. What a cute little house. Thanks for sharing. As always, you make me smile ! I just love your sense of humor just as I like your little wonky cottage! Thank you so much for the tutorial. its already on my to do list. A very good idea just popped(? is the right word) into my head. Since you always give us (me) so many ideas and even share your tutorials. I would like to send you a little (thank you) gift. Can you email me and give me your post address please. How absolutely lovely of you to go to the trouble of doing this tute! It's super gorgeous! You are most clever and sweet and generous in your stitchyness! Thank YOU! Very cute! My daughter would want me to make a family to go inside (pets too), then she'd want them all to have new summer wardrobes including new shoes, then probably some food to stock the kitchen with and it would go on and on until the house needed an extension. How sweet! I think it would make a cute sewing kit. Thanks! I love the little house. You have such lovely projects! This is going on my must try list and I'll be directing a few friends to stop by and check it out too. Thanks for sharing. What a lovely liite house and tutorial, so nice of you to share. How kind you are to take the time to post this for us all! I will definately be making this one! you need to have a flicker sight for all the little houses that are going to come out of this!! will definately make one for my mom. adorable!!! thank you for the tutorial. Thank you for the house tutorial! My Mother would rather hit the Bingo parlor, also! She and her sisters are big bingo fans. I shall make the house for my daughter....it's darling! thank you thank you thank you thank you thank you thank you thank you,can I say more? I just needed some inspiration for a little gift for my mommy, this is just what I need! so cute! thanks for the tut!! That is way too cute...I want to make one - I just hope I can get it to look as cute, esp. with the clothes on the line. You're so funny...I love that remark about throwing it at a kid. lol. This is adorable, and it is the perfect thing to make not for my mom (not with us anymore) but my equally adorable four year old niece! I adore this little house. It looks like the sewing box from CATH KIDSTON. I have been enjoying your blog! Funny what you said about your Mom! I think there is a generation that feels this way about handmade items! This is sooooooooo cute!!! I'll give it a try! this is ADORABLE! thanks for sharing the tut. I want one but expect I'll have to make it myself as my girls [and I have at least 5] don't even know how to threadle a needle! When is Mother's Day? Thanks for the tutorial. That's one beautiful little house. I specially love the clothesline. 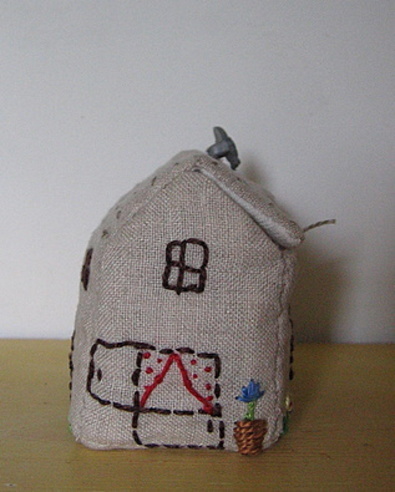 I made this tiny house today, and mine is extra wonky, but funny. Thank you for posting something that inspired me to sew pure frippery; as a beginner I sometimes think I should only sew useful, skill-building things. But I learned several new little things here and made myself laugh! My mom is the same about handmade gifts! Growing up when I was old enough to go to Hallmark to buy a card she would make unfiendly comments about my handmade cards! I LOVE everything handmade. those are such sweet houses.........what a neat idea. So so so cute, and I just love the details on the inside! Amazing, amazing, amazing, amazing,amazing, amazing, amazing, amazing!!!!!! Magic. I love it. My mother wouldn't appreciate it either. i'm going to give it to my mil for mothers day. please start a flcker group! Love it! Incredibly cute and genius all at once. I have got to make one, my daughters will want to fight over it I'm sure. great house and a tutorial! Can I live in one? I can't wait to give this a try. And greetings to you! I'm a-lurkin' no longer! I thank you also cordially for this beautiful instruction! Hey! Did you happen to action off a mohair kitty on ebay in January of "07 for charity? My computer died back in the fall and with it the bookmark to your blog! I was so heartbroken! All I had to go on was "mohair kitty"! I have been searching for you ever since and I think I have found you! Woo Hoo! Love your blog! This is just delightful! Simply adorable! 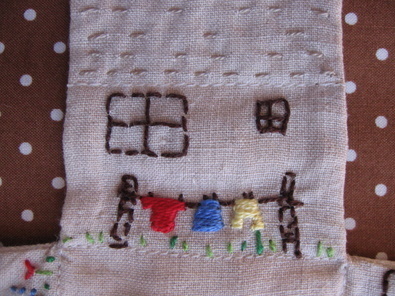 What a lovely house :) I will make one for my teabags!!! Thank you so much for the tutorial. I post a link to it from my blog today. I hope you don´t mind? 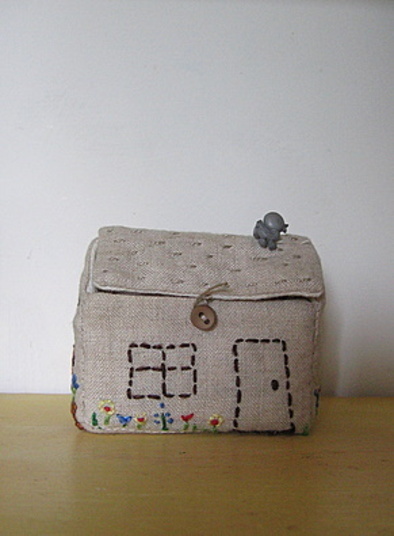 I love this little house, i will be making one for myself this weekend. Thanks for sharing the pattern. p.s. I love your section in "crafters companion"
So cute ... I will try to realise one ..
My comment serves a twofold purpose. One, I get to tell you just how much I'd personally like to live in your cottage. If I send you my measurements do you think we could work something out?